The Big Boss Grill was created to make your life easier. This one appliance makes cooking any meal quicker, cleaner, and easier. Each plate is removable for an easy clean in your dishwasher. The storage rack makes it easy and convenient to store and access each plate whenever you need it. 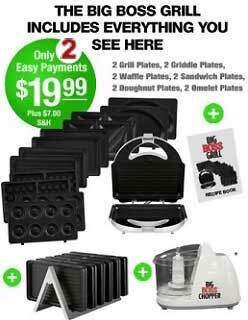 Simplify your kitchen with the Big Boss Grill appliance Amazing countertop appliance that goes from a grill to a griddle Simplify your kitchen with this 6-in-1 appliance Grill, griddle, make waffles, donuts and sandwiches with one appliance Includes non-stick plates for making griddles, waffles and omelets As seen on TV all-in-one counter top appliance Stop spending hundreds of dollars on cookware Interchangeable grill appliance for quick meals Cook meals in half the time with Big Boss Grill.